After I posted a recipe for Hassleback Potatoes with Chorizo and Eggs my neighbor, who loves chorizo just as much as I do, brought me a package of the kind of chorizo she uses (Cacique is the brand). It’s a Mexican chorizo that comes in a tube rather than individual links. I thought a “hash” with the chorizo and potatoes cooked in my cast iron skillet sounded like a good idea. But I didn’t stop there. After I gave my husband his plate, I had some potato/chorizo mixture left over so I thought I’d also try it with scrambled eggs instead of fried eggs. That was really awesome too! In fact, personally, I liked this version better. 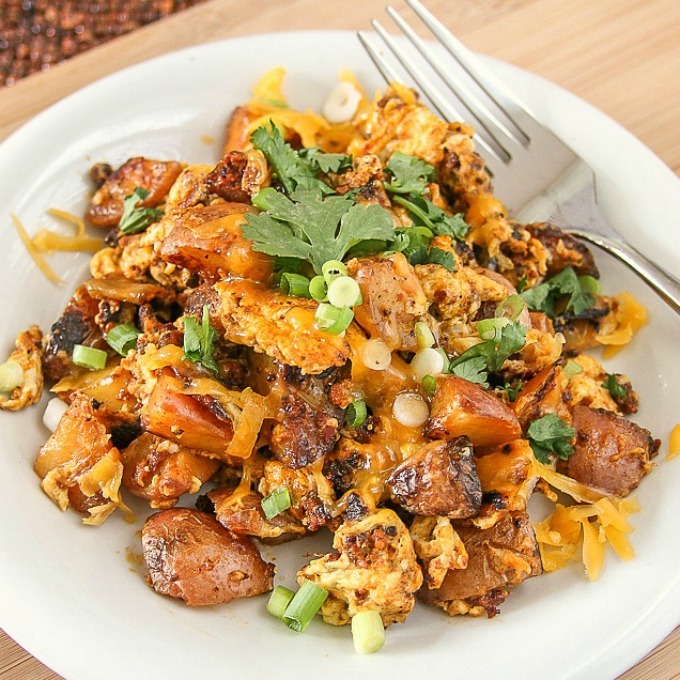 Just scramble the eggs in the same skillet with the remaining potato/chorizo. Both ways were so delicious so I thought it was best to give you options. If you prefer scrambled eggs over fried eggs, give the scrambled egg version a try. 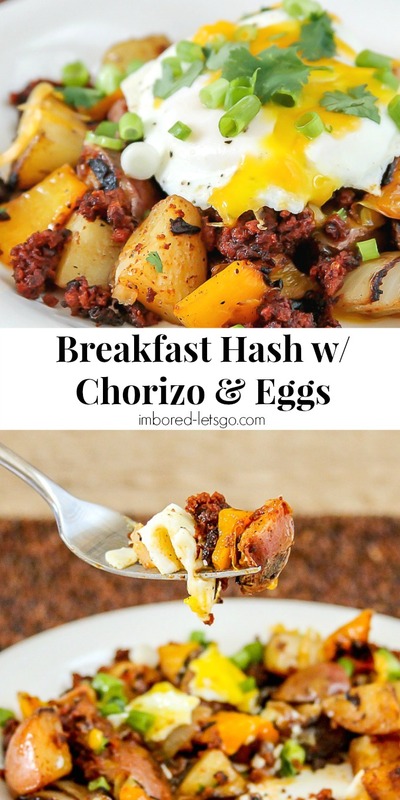 Oh, and PS…this Breakfast Hash with Chorizo & Eggs is also really good wrapped in a tortilla like a breakfast burrito. And who says you have to have it for breakfast? Makes a great dinner too! Mix a couple eggs together in a bowl as you normally would for scrambled eggs. Add to skillet with potatoes and chorizo and cook, stirring, until eggs are cooked. Then garnish as noted above. How many servings would this make? Thanks, Alsxis. Gosh, I don’t remember but a good guess would be about 4. Sorry I don’t have a better answer for you. Thats okay, I was hoping to get an estimate, thank you for the fast reply!! I was curious about this myself. Making this tomorrow. How do you think sweet potatoes would work? I think they would be delicious! Love sweet potatoes. Thanks!! I made this for my family and they absolutely loved it! Simple and delicious!! Happy to hear your family enjoyed it! Thanks for letting me know! I went a bit crazy with this. Used shredded hash browns, because that’s what I had. Had sliced peppers in the freezer, as well as chopped onions and a 9oz package of mild beef chorizo. Cooked it all as directed, then tossed in 6 eggs to scramble and a little Adobo seasoning. It was awesome! I ate mine out of a bowl, my dad had burritos and daughter made hers into taquitos. Son’s deciding what he wants to make out of his. Excellent recipe and delicious With my lazy cook hacks only took half hour start to finish. Thanks!! Would that be the one pound package of chorizo, or the five pound size? I didn’t boil them first but you could if you like. Don’t remember exactly how long to cook them, just until they’re tender, approximately 15-25 minutes depending on the size you cut them into.